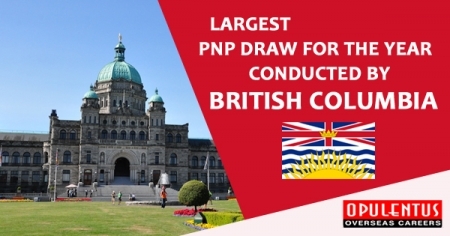 The immigration authorities of British Columbia, on September 19th conducted its largest draw, for the year. The aim is to attract international graduates and skilled workers. 409 candidates received the invitations. Moreover, this was the fourth time that the province crossed the 400 benchmark in 2018. The requirement for minimum points was 82 for skilled workers n the E.E and also for direct provincial streams. Additionally, for the International graduates of these streams the point’s requirement was 91. Finally, the semi-skilled and entry level applications needed 65 points only. The BC P.N.P. Tech Pilot will run till 2019, after it was launched in 2017. For now, it carries 29 occupations in the list and features relaxed requirements. The aim of these draws was attracting technology workers specifically. The province is famous for a booming technology industry. Moreover major tech-world names exist in this province. A nomination by the province guarantees selection under the E.E. System and gives 600 C.R.S. points. The Program, also informs the scores for the immigrants to have a guarantee of getting an invitation. The score which an overseas graduate needs is 30 points less than a skilled worker in the E.E and in the provincial streams. Again, the score is low for entry point and less skilled workers. To get more details related to Immigraiton fill out a Free Evaluation Form or contact us at [email protected] or call us 7207-111-222. One of our experts will meet your expectations and provide answers to queries.